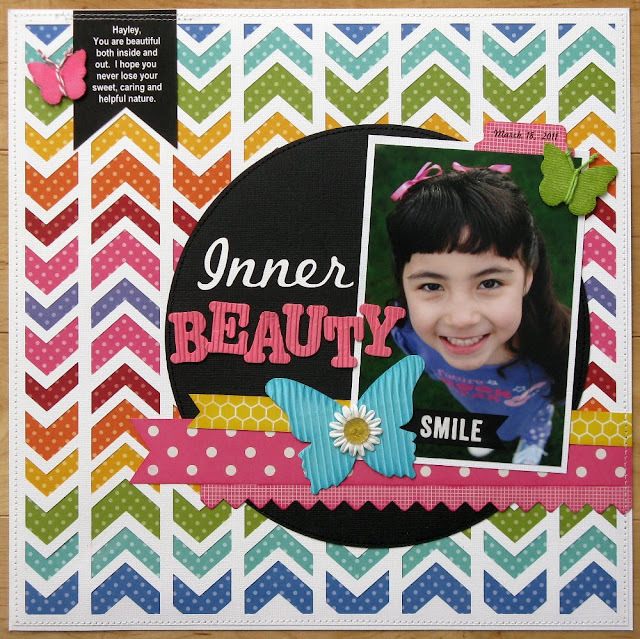 My first layout showcases papers from Pebbles Basics collection, a chalkboard "smile" sticker & some of their corrugated ABC stickers. I love me some basics so my first thought was to go a bit crazy and use several of the patterns, but in the end I decided it was going to be plenty busy and settled on the Mini Dot print. For my Chevron Striped Background template I used a wonderful Silhouette Cutting File designed by Sarah Hurley. Duplicate the overall chevron background shape. Set one aside to cut from the white cardstock as your overlay and then ungrouped the second one and remove/delete the outside outline. Regroup them by rows and using the offset feature, offset them by .04 or something like that so you have a little extra border to glue to the back of the white cardstock. Cut them out 2 rows out at a time from each of the colors (since there are two blue rows, two green rows, etc.). 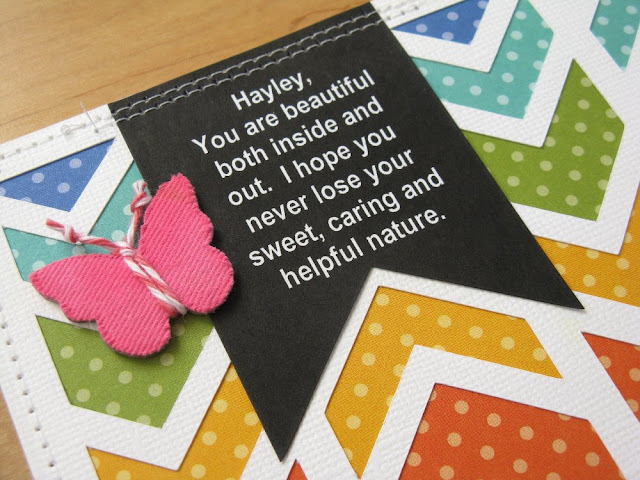 They stack nicely inside each other so it uses only a couple inches of each color of patterned paper. As you pull them off your cutting mat quickly number them on the backs so you can remember which order they went together (to avoid becoming a puzzle later). Then find some downtime to assemble. I put my pieces in a ziploc baggy with a Zig glue pen and took it with me to do during some downtime that I knew I would be having and glued a little bit as I went. I think it took me about an hour, but I didn't mind since I was going to be sitting idle anyway. It's a really great activity take on the go while at the doctors office, a sporting event or while watching TV with the family. As an alternative you could try offsetting them by a little bit more like I did with my butterfly in this tutorial I shared HERE and save even more time by having each row connected. To do this you would just need to create more vertical space between each the rows before offsetting to avoid your rows being welded to the row above or below. As my embellishment I altered some Studio Calico Canvas butterflies with pigment ink and tied baker twine with knots for the antennas. For my text I printed it on the computer using a black text box with white lettering and just made sure to leave excess black around my text so that I had room to cut out the pennant shape to match my V's. For my title I didn't have the right color of ABC stickers so I actually painted my black ones with a couple coats of pink paint. It worked really well. The script portion of my title was cut out on my Silhouette using the free font "Marketing Script". Next up is a quick little card I made using Pebbles Walnut Grove collection. A few patterned papers, some stickers and it was done. I wanted to give the Tim Holtz bracket label some pop, but with the way I tend to go overboard with foam tape I decided it would be more cost effective to go another route. I decided to diecut the label a second time from some scrap chipboard to give my card the extra dimension I was looking for and it worked really well. Lastly, here is a sweet little greeting card using one of my all time favorites, Pebbles Family Ties collection! I can't seem to get enough of the fresh colors and cute images from this line! For my shaped base I used This edger die by Papertrey Ink. Well that about wraps it up. Win or lose, I will be back soon to share my other projects after the team has been announced. Cross your fingers (and toes) for me! ;) Hope you all have a fabulous weekend! Oh absolutely gorgeous as always! 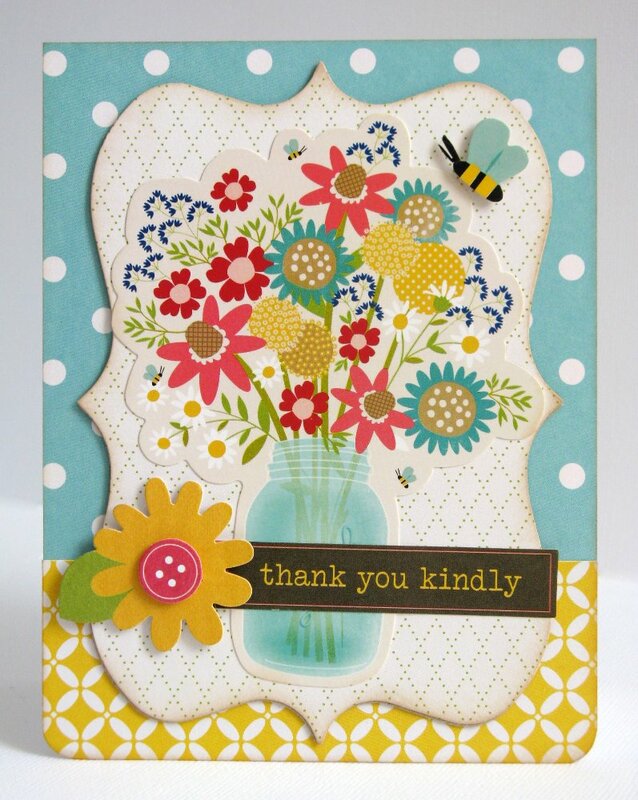 I love that layout and how you did all those pretty colors behind the chevrons... and the cards are just so sweet! I absolutely love your layout especially the great rainbow chevron pattern for the background! Such cute cards, too! These are super cute! Good luck! 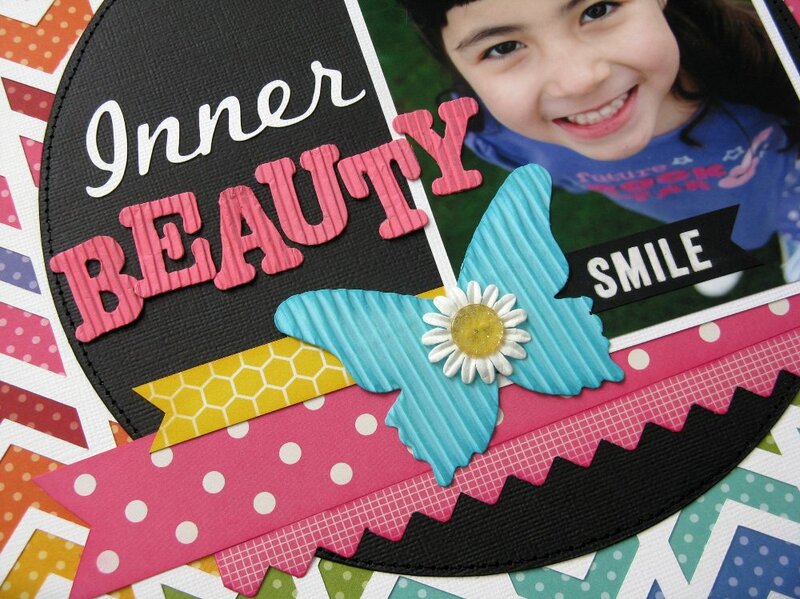 Your layout is just amazing--oh my goodness, that background must have taken you forever, but it is fabulous!! 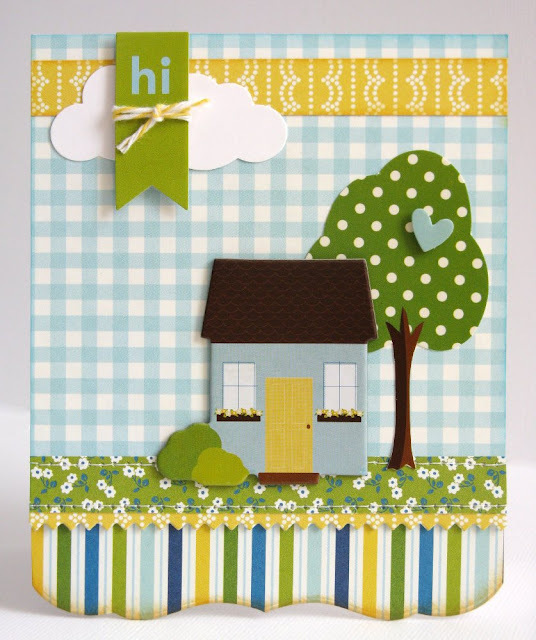 Love your cards too...especially that adorable house and tree one...love that color combo!